The Government had to increase the prices of fuel due to its poor economic management, MP Bandula Gunawardana said today. Addressing a news briefing, he said the incumbent Government did not have a long term economic policy in place. “There is a prevailing economic crisis caused due to the rupee depreciation,” Dr. Bandula said. “The Government has been unable to provide the advantage to the people in such a situation where the World Market price of fuel remains in a lower percentage than that in the precious regime,” Dr. Bandula said. “Although the World Market price remained in a higher percentage in our Government, we were able to keep the people unburdened. That is why I reiterate that this Government lacks a proper economic management,” he added. Meanwhile, MP Sisira Jayakody said even though Prime Minister Ranil Wickremesinghe was boasting of the growth of the economy, they could not see any such growth. “The economic growth rate is diminishing compared to that in the previous Government. We were able to maintain a growth rate of six but now it has declined even below three,” MP Jayakody said. Honored sir,the incumbent government is well versed in their personal economy! When in Opposition and no power, Bandula talk like a Nobel Laureate!!??? Huh!! 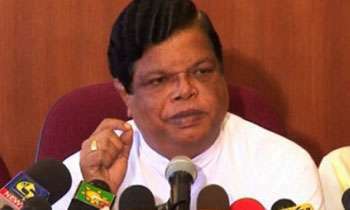 Bandula famously said in March 2012, that a Family of three can live with 7500 a month!!! Wow, Now criticize the government for poor economic management!!!?? And, during their time, the prices of fuel must have gone up due to their efficiency? it was Rs. 2500 and not Rs.7500. MR also had to increase the prices of fuel, gas etc due to his poor management. Isn't it? If not u had no guts to say that? Yes, but oil prices are about to crash again because of the new sanctions on Iran. Prices will actually rise if anything as there will be a shortage in the world market. No it is other way around. Sanctions reduce supply so price will go up from higher demand on other producers. All politicians present and past, think their only duty is to collect as much money as possible and enjoy life to the max. At the expence of the poor voter who voted them to power ! . This is purely a power struggle. Just utter something to get attention.Please note that there is a limit politic-asses can fool masses. World fossil fuel prices are not manage by grade eight standard Sri Lankan politic-asses. The rupee was artificially kept low by your friend Cabraal but that has other serious consequences as people are fooled thinking of cheap oil and other products and increasing consumption. This is artificial and hence the present problem of increased debt caused by your govt. and even your growth rate was false using wrong CB statistics. See who is talking. He know's only to find fault. This is not poor economic management. Increase of cost of living is due to high taxes to pay off the debts taken during your previous regime. During your regime, the fuel price was over RS. 150/-, is it due to the poor management of MR.